· Drag an icon from the Themes section of the Album to the Movie Window. · Select Add To Project in a theme template icon’s right-button context menu. · Paste the contents of the Windows Clipboard after you have cut or copied an existing theme clip. · Themes whose content is a graphic overlay with transparent background, such as a title or PIP frame, are usually added to the Title track. 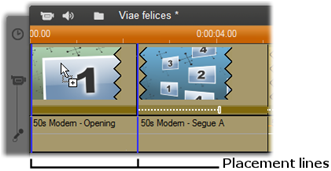 · Themes with full-frame video, such as opening sequences, can be added to the Main video track (Studio) or the Overlay video track. The default length of a theme clip depends on the design of the individual template. If you drop a new theme clip onto an existing one on the Timeline, the new clip either is inserted beside the old one or simply replaces it. The choice of operation depends on the position of the mouse pointer relative to the target clip when you release the button. Inserting a theme clip before or after an existing clip: If you drop the new clip near the start or end of an existing theme clip, it is accordingly inserted before or after the existing clip. The placement lines that show the position of the new clip on the Timeline are drawn in green. A new theme clip, represented by the ‘copy’ mouse pointer, is dragged near the beginning of the left-hand clip. Green placement lines indicate where the new clip will be inserted. 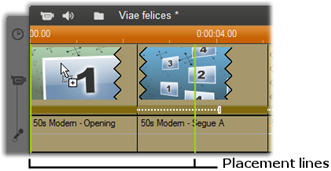 In the illustration, the placement lines show the boundaries of the clip that would be created by releasing the mouse button at the current position, based on the template’s default length. All existing clips would be moved rightwards to accommodate the new one. If you were instead to drop the new clip near the right-hand edge of the same existing clip, it would be inserted after the clip. Replacing an existing clip: If you drop a new theme clip onto the middle of an existing one, the new clip replaces the old one. The new clip also takes over any existing customizations of the old clip. The placement lines, drawn in blue, show the boundaries of the clip to be replaced; regardless of its designed default length, the new clip will inherit these boundaries. A new theme clip is dropped onto the middle of the left-hand clip, replacing it. The positions of other clips are not affected.